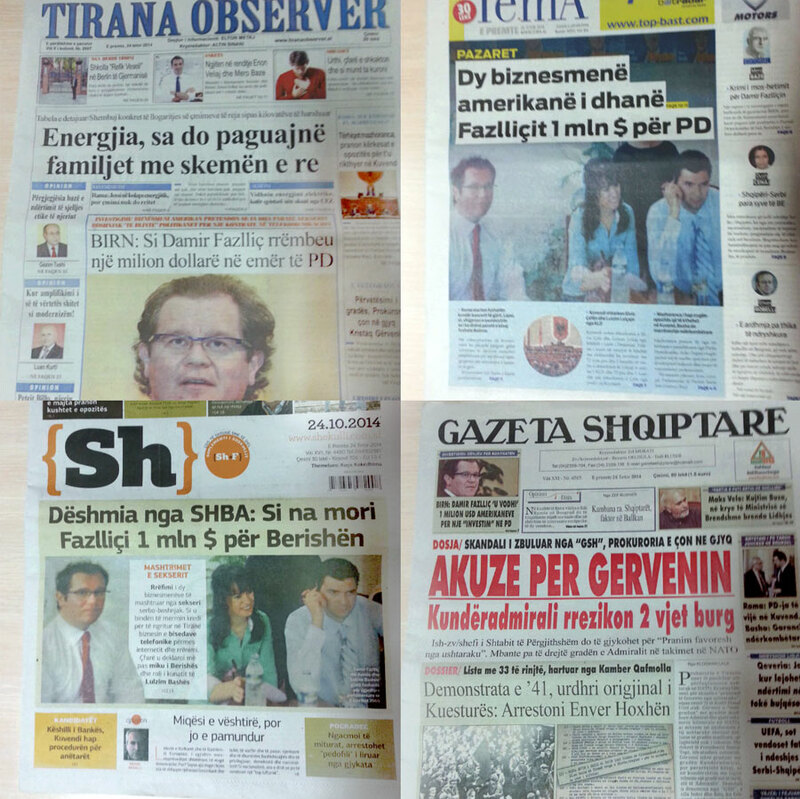 An investigation by BIRN Editor Lawrence Marzouk and local journalists in Albania and Serbia has received widespread republications and praise in the Albanian press and broadcast media. The investigation ‘Albanian Telecoms Deal Cost ‘$1m to Buy Off Politicians’, Claim US Businessmen,’ uncovers how controversial Bosnian businessman Damir Fazlic, a fixer with powerful friends in Washington DC and the Balkans, requested $1m in ‘investment’ from its US partners for Albania’s Democratic Party, in order to secure a lucrative telecoms contract. The investigation is part of a series of hard-hitting stories on Fazlic reported in the last few months by Marzouk and his team, focusing on the businessman’s ties to former Albanian Prime Minister Sali Berisha and his family. The last investigation received dozens of republications in the Albanian online, print and broadcast media and provided food for thought for local political commentators. In an editorial in the daily Tema on October 23, publisher Mero Baze called for an official investigation by prosecutors based on the latest report published by BIRN. “The prosecutors cannot turn a blind eye on the declarations made in a prestigious media by two American citizens,” Baze wrote. “If the prosecutor’s office will not launch a probe…then it’s the prosecutor’s office that should be investigated,” he added. The investigations on Fazlic are part of a project called “A Paper Trail to Better Governance”, financed by Austrian Development Agency to hone investigative journalism in the Balkans, hold officials to account and improve the implementation and use of freedom of information laws. The stories published as part of the project have sparked political debate and led to calls for investigations of Albania’s former premier Sali Berisha and his family. Reacting to a BIRN investigation which revealed how the inner circle around Berisha earned millions of euros from suspect land deals with Fazlic, Albanian Socialist MP Erjon Brace called on tax authorities to launch a probe. “The tax and money-laundering authorities should verify the transactions of these oligarchs,” Brace wrote on his Facebook page. “The new evidence is challenging and totally proves the allegations,” he said, referring to BIRN’s report.